4 Sorry! We’re not quite ready for you. Come back soon. Your video is being made, it may take another day but the video will be available to you. Once the video is available you can edit and share it. How to Make Year in Review Video on Facebook 2018. 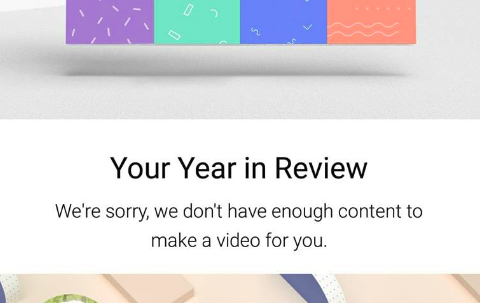 No enough contents to create year in review video. Thanks for Being Here! Name, we currently don’t have enough content to create your 2018 video. Keep posting to see more memories and have a happy new year. Peoples are getting their videos now. It will be soon available for you too. Now we need a little bit more to wait. Dont forget to share your video here. Facebook users are not getting the videos and its been a long waiting. Some facebook users are sharing and enjoying the year in review video and some still cant find anything. They just get is the error message and some details like You made 8 new Facebook friends in 2017, Your friends liked, loved, haha’d and wowed your posts 236 times in 2017 and Your biggest fans in 2017. Some images with of friends in respected category. Facebook should have made this available for all. Sorry! We’re not quite ready for you. Come back soon. This error is shown to every users around the world. May be facebook is making video for each of the users. But as error message said We’re not quite ready for you, some users should be able to share. But non are able to share the video. It should be something wrong in facebook. Its be about 8 hours since I am getting this message but nothing has changed. We will update the post soon if it got changed or updated. One of our visitor share this image with us. But There are a lot of post and images in his profile. This could be another issue with Facebook Year in Review video tool. As the error message says Sorry! We’re not quite ready for you. Come back soon. It means other users should be able to share the videos, It should be ready for some other users of the facebook. It may be because of the large number of users in facebook and large no. of peoples are requesting for the video facebook server is busy on handling it. But I could not find any peoples being able to share their videos. For any part of the world. So may facebook have some issue with it. Or may be facebook is trying to make this service available to all peoples around the world at the same time. Whatever the issue is we hope facebook is working on it. And facebook should make it available real soon.